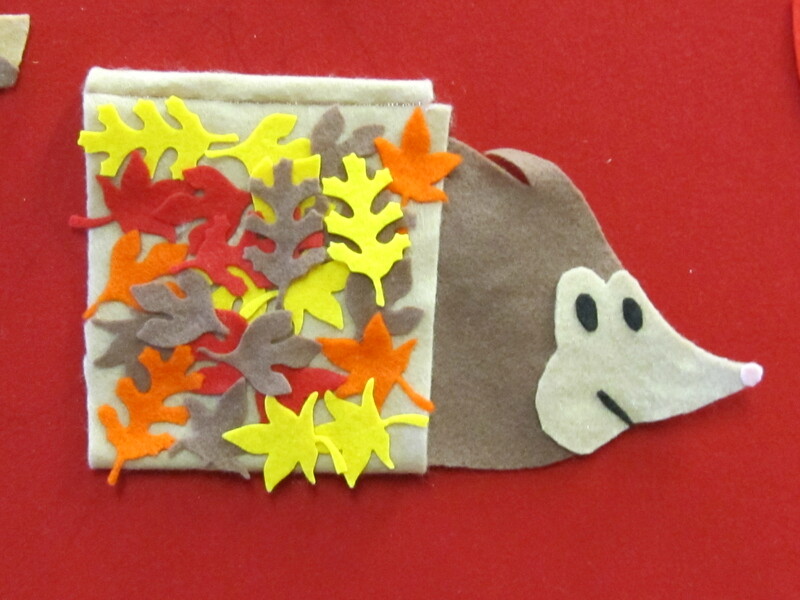 Poor little Hedgehog has been working his little quills to the nub to build his little dream nest. It’s perfect, don’t you think? 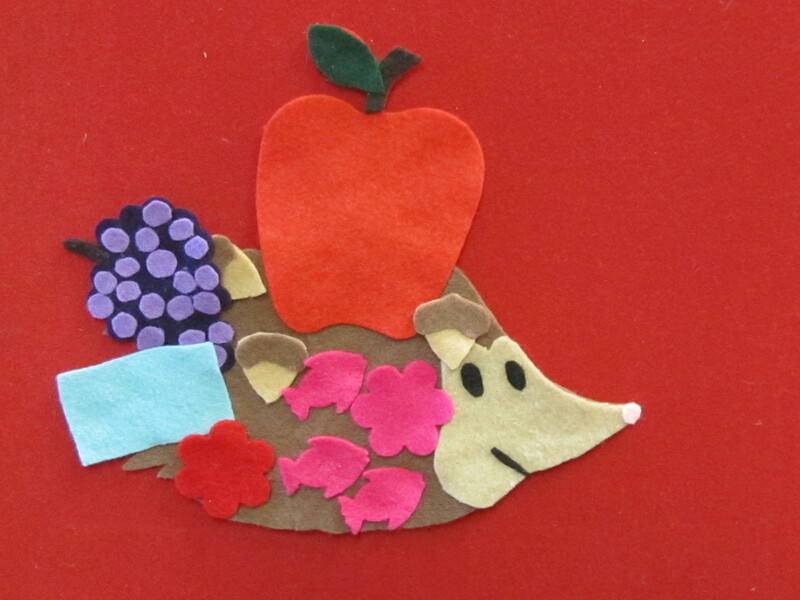 Lovely colors, and the perfect size for this prickly little hero. Now that he is finally done he is ready for a nap. He takes one more moment to admire his handiwork, when suddenly…. 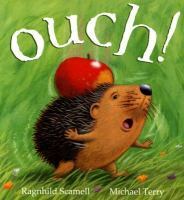 “OUCH!” An apple falls from a tree, and hits Hedgehog right on his head. Noone likes a knock on the noggin, but for a hedgehogs it’s even worse! 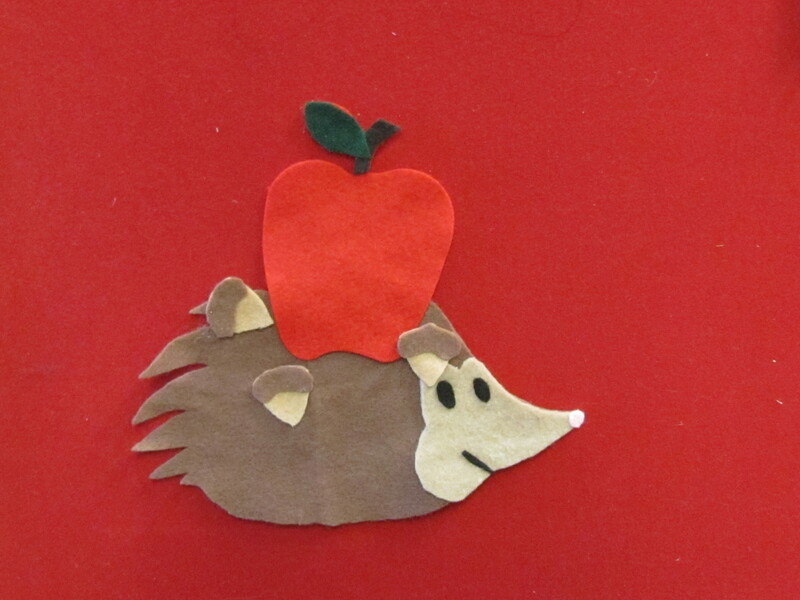 The apple sticks to his quills! Can he fit in his new home? No! Poor Hedgehog. He tries rolling up in a ball, because that’s a hedgehog’s best defense. The apple doesn’t budge. Hedgehog is close to tears, when his friend Squirrel comes along. Squirrel has been collecting acorns. Squirrel wants to help his friend. He grabs the apple with both paws, and pulls with all his might. The apple doesn’t budge. What’s worse, is that squirrel didn’t put down his acorns before he grabbed the apple, so guess what happened? 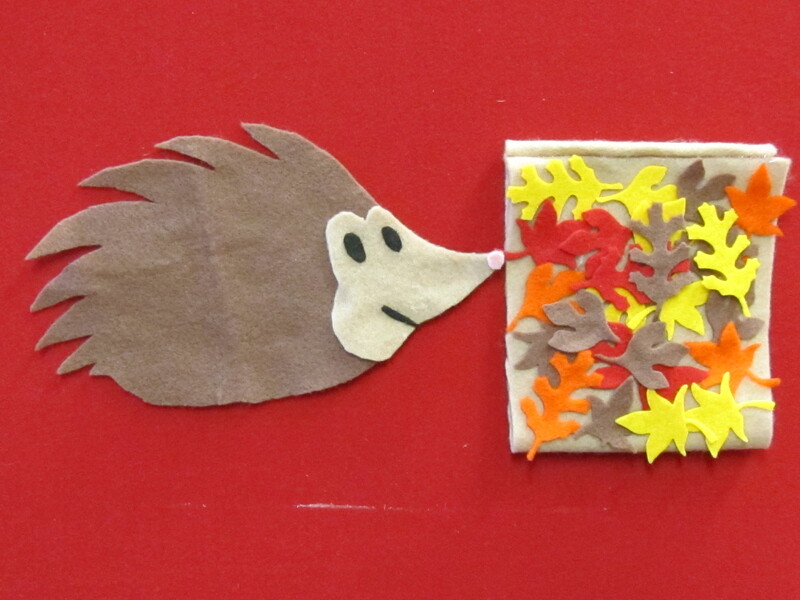 Squirrel's acorns get caught on Hedgehog's quills too! Poor Hedgehog. Next, possum comes along. He’s snacking on some delicious grapes. He offers to help. He grabs the apple with both of his paws, and pushes with all his might. 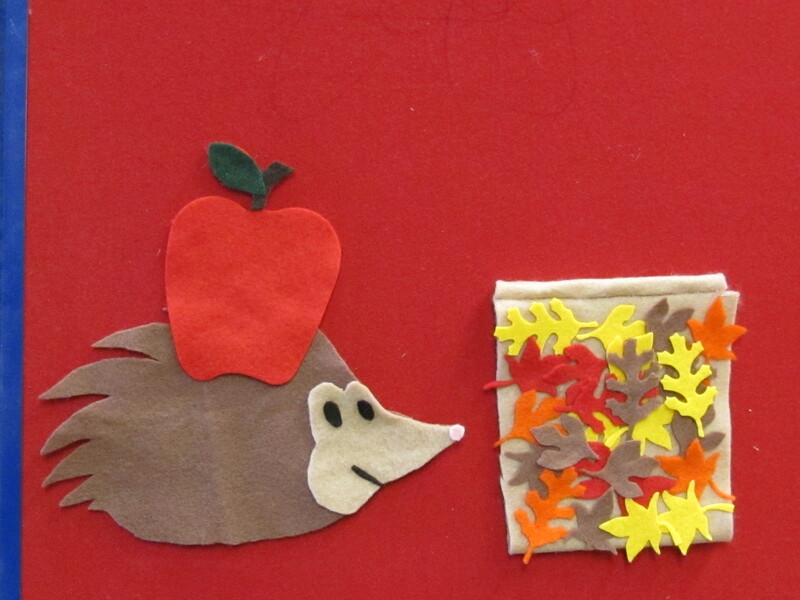 The apple and the acorns don’t budge. To make matters worse, possum forgot to set down his grapes before he grabbed the apple. Oh no! 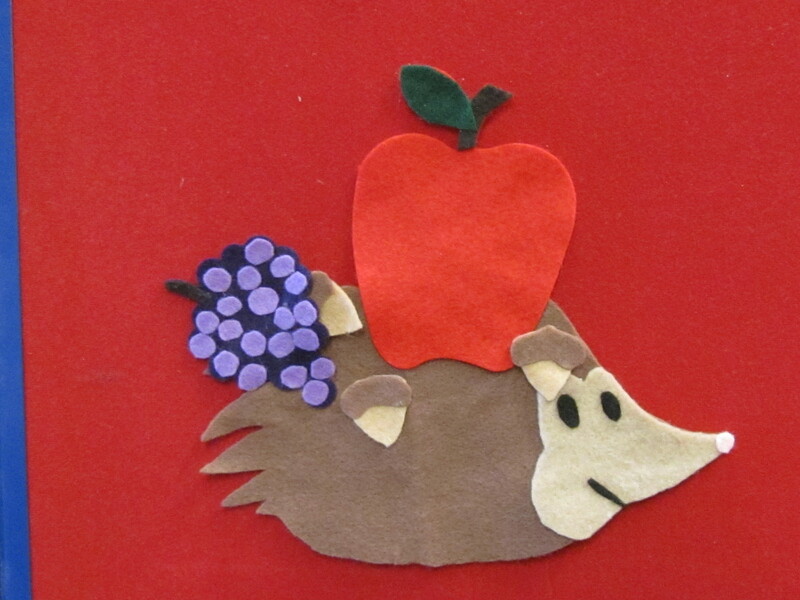 Now there are grapes caught on his quills too! Poor Hedgehog. Suddenly, a strong gust of wind blows a little blue scrap of paper through the air. It floats through the trees, over the grass, and past hedgehogs nest, and lands on hedgehog’s back right behind the acorns. Oh no! Now there are scrap of paper is caught on his quills too! Poor Hedgehog. Oh no! Now there are flowers caught on his quills too! Poor Hedgehog. Oh no! Now there are fish caught on his quills too! Poor Hedgehog. Hedgehog is distraught! I’ll never fit in my perfect little nest! But just as hedgehog is about to give up all hope, and get to work on giant nest that will fit all this stuff, his friend Goat comes for a visit. I’ll tell you something about goats. They are very special animals for 2 important reasons 1) they are always hungry; and 2) They can eat anything! It just so happened that Goat’s tummy was rumbling something awful when he ran into Hedgehog. When he spotted his cluttered pal, a wide goaty smile spread across his big goat face. It's a perfect fit! Sweet dreams, Hedgehog. 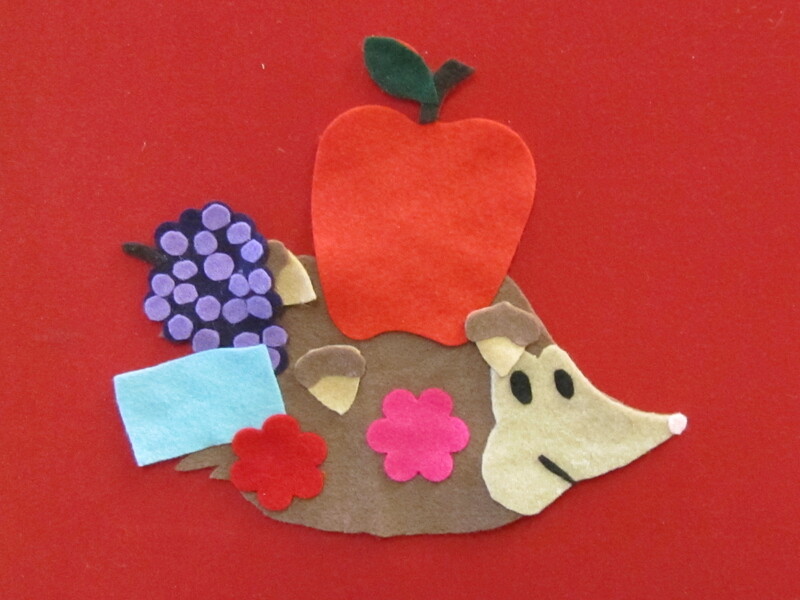 **I cut one 8×10 piece of felt in half length-wise. Then I sewed the two short ends together. 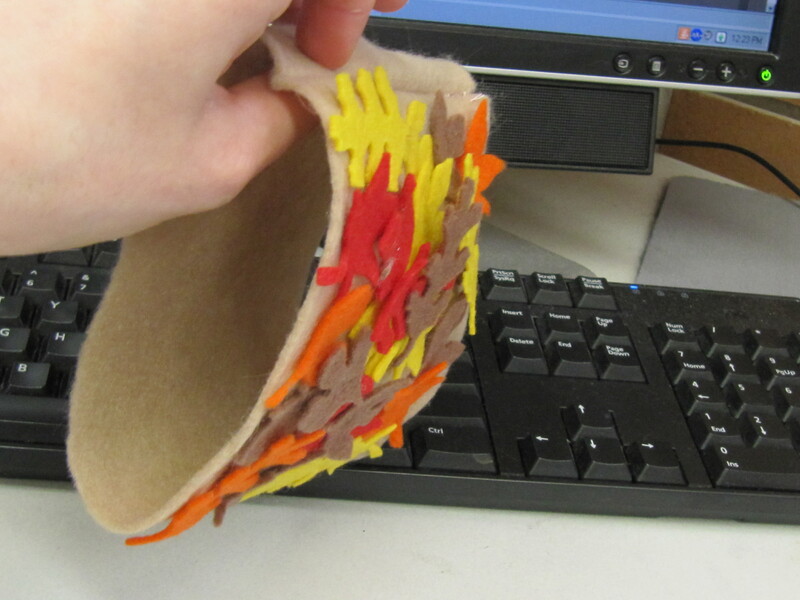 Katie is the hostess with the mostest this week, so visit her blog for the #FlannelFriday Roundup. This is such a wonderful flannelboard story. It’ll adapt for two year olds. So, now I have to find this book. Hedgehog is adorable. Nicely done. What a cute fun story and flannelboard! Hedgehogs are a favourite of mine. I definitely want to make this. This is a ridiculously cute flannelboard — I’m going to have to remember this for when I do fall animals storytime this…well, fall.